Since writing my original review in 2003, Totoro has remained one of the few restaurants that I keep returning to. In fact it's one of those places I crave, especially at those moments when a few friends want to meet me for lunch and ask me where the REALLY good food is hiding. Totoro has that warmly familiar quality with casual friendliness, and food that resonates deep down to the comfort zone. I wanted to update this page to mention that Totoro offers some new dishes that succeed very well, and certainly will keep me returning. Recently I tried the new Seafood Pancake ($8.95) which I might best describe as a cross between an omelette and a pizza (no cheese of course.) At the base, a blend of rice flour and egg offers support to a savory blend of bay shrimp, calimari chunks, scallions, carrot shavings, bits of fresh garlic and feisty jalapeño pepper. A dipping bowl lets you augment the already-full flavors with light soy sauce and red pepper sesame oil, a perfect marriage to this addictive Korean pizza. Totoro also added a bento box special ($8.95 lunch, $9.95 dinner) that offers excellent variety and value. I tried it at lunch and took leftovers home that fulfilled half of dinner. Numerous side dishes accompany a meat course selection, which appears on a sizzling cast iron platter alongside the large segmented tray full of extras. Meat choices include breaded fried pork or chicken (katsu), chicken teriyaki, or one of four bulgoki with either beef, chicken, pork or squid. I recommend the bulgoki, as these count among my favorite dishes at Totoro, and they are more traditionally Korean. Before the bento arrives, a flavorful bowl of miso soup whets the appetite, slightly different from a Japanese miso, a bit more salty, with bright flavors and small black floaters that taste to me like sprouted onion seeds (I didn't get a chance to ask what these were, but they added interest and depth.) Other bento sides included clear bean thread noodles with slices of fish cake and vegetables with a sweet sauce, three types of house made kimchee, rice and three large pieces of tempura vegetables. On that day, the tempura included brocoli, yam and butternut squash. A light dipping sauce came alongside for the tempura in a separate bowl. This is a great bargain. Lunch that day kept me going until bedtime. I should also add that vegetarians can find one of the most flavorful hot pots around, with a bowl of kimchee, bean thread noodles and tofu (Kimchi Jigae, $8.95.) Ask the server about vegetarian needs, and the kitchen should be able to adjust accordingly. Since my original review, several new restaurants have come and gone on Castro street, and now there's even another Korean restaurant near city hall. But I keep retuning to Totoro because the food makes me happy; and, I like these folks a lot. Appearances can deceive the casual passerby, who might think Totoro is a fast-food franchise from Korea or Japan. Laminated color pictures of food in the front window and on the menu help convey this impression. Brightly colored modern furniture and Korean drink posters further suggest an informal fast-food atmosphere. 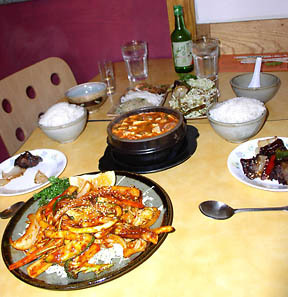 In fact, this pocket sized Korean restaurant on Villa Street is privately owned and unique to Mountain View, serving value priced platters of sweet spicy barbeque, wholesome hot pots and noodle soups, skewered appetizers and more. Large portions, fresh flavors and friendly service make Totoro a great choice for lunch or a low-key dinner. 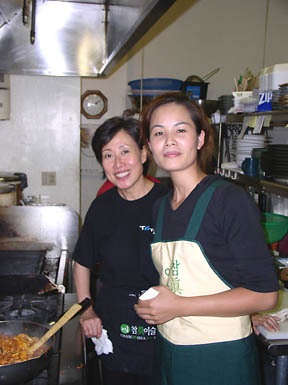 Jung Ja Kim greets her patrons with an infectious smile, and she cheerfully helps newcomers with questions about the food. Although mild language barriers sometimes intrude, the picture menus do help solve some uncertainties. Chef Brigitte Kim brings an artist's touch to each generous dish. She comes from a restaurant family, with parents and siblings still running establishments in Seoul. Thirty-three year old Kim was a sushi chef for 12 years at Michi and Niko restaurants in Campbell. Kim explained how she has adjusted her ingredients to appeal more to an American palate. Personally, I love the intensely spiced, garlic infused, fermented flavors of Korean cuisine. However, I know not everyone shares my xenophile tastes, and Totoro succeeds with a good compromise between tradition and accessibility. Since they make each dish to order, you can always ask for an extra dose of heat if you're feeling adventurous. The kitchen will happily add more of their special Korean pepper paste. One of my favorite features of a Korean meal is the multitude of tiny plates that cover a table, an ornamental range of condiments including the ubiquitous kimchi. Totori doesn't get fancy, but they do bring an attractive ceramic plate to every table with kimchi, marinated bean sprouts, and pickled daikon. Kimchi may not appeal to everyone, but I love its tart spicy intensity. Totoro's traditional blend of fermented napa cabbage uses less garlic and hot pepper than some, hopefully appealing to a wider range of palates. The bean sprouts taste light and refreshing, dressed with sesame seeds, green onion, salt, pepper and sesame oil. The crunchy pickled daikon (a mild long white radish) has just the right mix of sweet and sour to get my mouth watering. Totoro seems busiest at lunch, with many of its eleven tables filled by local techies chatting over steaming bowls of noodle soup or beef stew. Lunch and dinner plates resemble each other except that lunches run a dollar less. Lunch entrées cost $6-10, dinners $7-11. Lunch platters come as individual servings with rice on the plate, kimchi alongside. Dinners come in slightly larger portions, with separate bowls of rice. On my first lunch visit I ordered the Pork Marinated with House Spicy Sauce ($7.95) which arrived scant minutes after I placed my order. The meat came on a bed of sliced fresh cabbage with a dome of firm white rice and an orange wedge. Thin ribbons of tender pork were bathed in a sweet spicy house barbeque sauce with julienned onions, carrots, scallions and sesame seeds. This has proven to be my favorite dish so far at Totoro, and I look forward to trying their BBQ beef and chicken. The lunch portion was so large that the half I took home sufficed for dinner. Totoro's larger dinner portions can easily be shared family style. Something about Totoro's hidden location and bright decor might deflect people at dinnertime, which is a shame. Considering its friendly informal atmosphere, I think Totoro could prove a good place for parents to dine with children. An appetizer of Skewered Beef with Vegetables ($4.95) would serve well as a child's main course. Six large thin slices of marinated brisket are folded into accordion cubes and wedged between bell peppers, onions and scallions, grilled with a light char and doused in caramalized soy dressing. Flavors are sweet and comforting. Other kid-friendly side dishes include skewered shrimp or chicken ($5.95, $4.95), Deep Fried Pot Stickers ($4.95) and Marinated Deep Fried Chicken ($9.95). Simple meat entrées like Don Katsu (pork cutlet, $8.95) and Chicken Katsu ($6.95) might also please a finicky eater. The (not-so-kid-friendly) Sautéed Squid in Spicy Sauce ($7.95) arrived in heaping portions, filling its platter with long slices of slightly rubbery calimari, fish cake, carrots, onions and zucchini in a red peppery sweet soy sesame sauce. The tentacles (usually my favorite part) felt a bit tough to the teeth, but tasted fresh and spicy sweet. The Seafood Tofu Hot Pot ($8.95) came in a bright and spicy broth blending housemade beef and fish stock. Shelled clams and medium whole shrimp (with heads) joined soft tofu and green onions, with a raw egg cracked at our table to cook lightly in the pot. Unable to dissect the whole shrimp with chopsticks and spoon, I used my fingers. Despite the inconvenience, I prefer whole shrimp to cleaned shrimp in such dishes, for its sweeter more buttery flavors. Numerous other hot pots include beef or mushroom tofu pots, spicy beef stew, and noodle bowls with beef, vegetables, chicken or tempura ($6.95-$8.95). Only a few of Totoro's offerings would suit a strict vegetarian. These include Chap Chae, sautéed clear noodles with vegetable ($8.95) and Kim Bob ($7.95), hand-rolled "sushi" with seaweed, rice, vegetables and egg. Chef Kim makes the Kim Bob to order, and she can adjust the ingredients to fit special requests. Totoro offers soft drinks, iced or hot tea, a small selection of Japanese and Korean beer and sake, and an intriguing list of Soju Yogurt Cocktails ($10.95). These blend strawberry, peach, lemon or pineapple with yogurt and a clear alcohol made from fermented rice and barley. Curious to try soju on its own, I ordered a chilled bottle of Jin Ro So Ju ($9.95). I found it to be smooth and mild, slightly malty, like a low-octane cross between vodka and sake. Those fruit cocktails sound quite interesting. Dubious at first about Totoro's modernized appearance, I have become fond of this humble nook, with its fresh kimchi and savory meats, its portions so large I have yet to leave without leftovers. If you like barbecue, try Totoro for lunch and order a plate of Bul Go Ki, one of the spicy marinated meats. It might become addictive.